We studied every book we could get our hands on and attended every course we could find prior to having children. We were like sponges eager to soak up whatever we could find to prepare us for parenting. We had our baby, survived the toddler years, and sailed through the next few years. And then it happened. School let out for the summer and it was as if the school sent us a different child. I kept asking myself where my little boy had gone. I found myself doing the math and thinking, we are still a few years from the teenage years. What’s going on with my child? I knew there was a preteen phase prior to the teenage years, but surely just a few months shy of his ninth birthday, we were not at that phase yet. 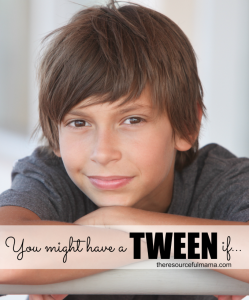 The tween years or preteen years can be the most baffling years of your child’s development. They are not yet a teen, but no longer a little kid. They are stuck between the two. This is a confusing time for both of you. It’s confusing because one minute they seem like the child who you have parented for the last 9, 10, 11… years and the next minute they seem ready to enter the teen years. I’m not big on adding labels. I tend to take things as they come, but I felt the need to define this stage, to better understand and interact with my child. 1. One minute they are pushing you away and the next minute they are asking you to lay with them for a few minutes at bedtime. 2. They won’t show you affection in public, but will in private (if initiated by them). 3. Their friends become much more important. They still enjoy spending time with their family but ask more and more to spend time with friends. 4. The tantrums are back, still with outbursts of emotion, but with eye rolling and door slamming. 5. They shrug away when you pat them on the shoulder or back. 6. What seems a small, inconsequential thing can really upset them and make them moody, aka hormones. 7. One minute you don’t know anything and the next minute they are having deep conversations with you. 8. “Whatever” finds it’s way into their vocabulary. 9. They spend more time in their bedroom, but still want you to play with them. They want to shoot hoops with you or throw a few balls. 10. They anger, frustrate, perplex, love, surprise, delight, and awe you, all within the same day. There will be times when you a ready to pull your hair out. There will be other times when you are beaming with pride, because they have proved once again that you are raising a great child. You hit all the signs that my daughter is showing. It’s so hard to tell if she is going to be in an “I love you” mood or an “Why do parents have to be so lame” mood. I remember being her age and wanting to be in my room and read and imagine all the time, so I try to give her space, but it’s hard! We are on the tail end of the tween years- in fact, only 6 months left to go until 13! Anyway, this time is tough! I never thought I would actually buy into all the stuff about how they don’t like you and all that, but man, it actually hurts when they are older! The younger kids you know are just mad, but the older ones? Ouch! Thanks for writing about this tough time and giving me a little encouragement!